Cherry Jones (born November 21, 1956) is an American actress. A five-time Tony Award nominee for her work on Broadway, she won the Tony Award for Best Actress in a Play for the 1995 revival of The Heiress and for the 2005 original production of Doubt. She won the 2009 Primetime Emmy Award for Outstanding Supporting Actress in a Drama Series for her role as Allison Taylor on the FOX television series 24. She has also won three Drama Desk Awards. Jones made her Broadway debut in the 1987 original Broadway production of Stepping Out. Other stage credits include Pride's Crossing (1997–98) and The Glass Menagerie (2013–14). Her film appearances include The Horse Whisperer (1998), Erin Brockovich (2000), The Village (2004), Amelia (2009) and The Beaver (2011). In 2012, she played Dr. Judith Evans on the NBC drama Awake. Jones was born in Paris, Tennessee. Her mother was a high school teacher and her father owned a flower shop. Her parents were very supportive of her theatrical ambitions, encouraging her interest by sending her to classes with local drama teacher, Ruby Krider. Jones takes great pains to credit her high school speech teacher, Linda Wilson, with her first real preparatory work. 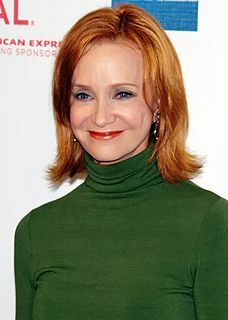 She is a 1978 graduate of the Carnegie Mellon School of Drama. While at CMU, she was one of the earliest actors to work at City Theatre, a prominent fixture of Pittsburgh theatre. Most of her career has been in the theatre, beginning in 1980 as a founding member of the American Repertory Theater in Cambridge, MA. Her Broadway performances include Lincoln Center's 1995 production of The Heiress, and also a 2005 production of John Patrick Shanley's play Doubt at the Walter Kerr Theatre. For both roles she earned a Tony Award for Best Leading Actress in a Play. Other Broadway credits include Nora Ephron's play Imaginary Friends (with Swoosie Kurtz), the 2000 revival of A Moon for the Misbegotten, and Timberlake Wertenbaker's Our Country's Good, for which she earned her first Tony nomination. She is considered to be one of the foremost theater actresses in the United States. In 1994, she also appeared in the Broadway run of Angels in America: Millennium Approaches and Perestroika as the Angel, replacing Ellen McLaughlin who had originated the role. She has narrated the audiobook adaptations of Laura Ingalls Wilder's Little House series including, Little House in the Big Woods, Little House on the Prairie, Farmer Boy, On the Banks of Plum Creek, By the Shores of Silver Lake, The Long Winter and Little Town on the Prairie. In recent years, Jones has ventured into feature films. Her screen credits include Cradle Will Rock, The Perfect Storm, Signs, Ocean's Twelve and The Village. Jones played President Taylor on the Fox series 24, a role for which she won an Emmy for Outstanding Supporting Actress in a Drama Series. She played the role in the seventh season, from January to May 2009, as well as eighth season, which aired from January to May 2010. In 2012, Jones starred in the NBC drama series Awake as psychiatrist Dr. Judith Evans. Also in 2012, she portrayed Amanda Wingfield in the Loeb Drama Center's revival of Tennessee Williams' The Glass Menagerie alongside Zachary Quinto, Brian J. Smith and Celia Keenan-Bolger. In 2014, Cherry Jones was inducted into the American Theater Hall of Fame. In 2015 and 2016 Jones had a recurring role on the Primetime Emmy Award-winning Amazon comedy-drama series Transparent in its second and third seasons. She was nominated for the Critics' Choice Television Award for Best Guest Performer in a Comedy Series for her work in the 2015 season. In 2016, she appeared in "Nosedive", an episode of the anthology series Black Mirror. In 2018, Jones will be playing Holly, the feminist mother to June/Offred in The Handmaid's Tale who has only been mentioned in passing during flashback scenes. She will appear in episode three. Jones is openly lesbian. In 1995, when Jones accepted her first Tony Award, she thanked her then-partner, architect Mary O'Connor, with whom she had an 18-year relationship. She started dating actress Sarah Paulson in 2004. 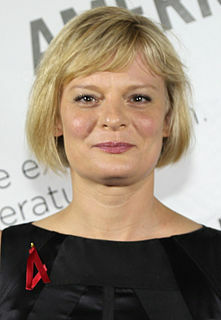 When she accepted her Best Actress Tony in 2005 for her work in Doubt, she thanked "Laura Wingfield", the Glass Menagerie character being played in the Broadway revival by Paulson. In 2007, Paulson and Jones declared their love for each other in an interview with Velvetpark at Women's Event 10 for the LGBT Center of New York. Paulson and Jones ended their relationship amicably in 2009. In mid-2015, Jones married her girlfriend, filmmaker Sophie Huber. 1987 Spenser: For Hire Tracy Kincaid Episode: "Sleepless Dream"
1993 Tribeca Tough Woman Episode: "The Loft"
2001 Frasier Janet Episode: "Junior Agent"
2002 The American Experience Narrator Episode: "Miss America"
2004 The West Wing Barbara Layton Episode: "Eppur Si Muove"
2016 Black Mirror Susan Episode: "Nosedive"
2018 Portlandia Ms. Mayor Episode: "Rose Route"
^ "Cherry Jones Biography (1956–)". Retrieved 5 May 2015. ^ Chinoy, Helen Krich; Jenkins, Linda Walsh (26 May 2018). "Women in American Theatre". Theatre Communications Grou – via Google Books. ^ Conner, Lynne (2007). Pittsburgh In Stages: Two Hundred Years of Theater. University of Pittsburgh Press. pg. 247. ISBN 978-0-8229-4330-3. Retrieved 2011-07-15. ^ Hartigan, Patti (11 May 2017). "Cherry Jones returns to the city where she launched her career". Boston Globe. Retrieved 1 September 2018. ^ Brantley, Ben (14 February 2013). "'The Glass Menagerie,' at Loeb Drama Center, Cambridge, MA". New York Times. Retrieved 17 February 2013. ^ Joyce Eng (20 September 2009). "Kristin Chenoweth, Jon Cryer Win First Emmys". TVGuide.com. Retrieved 2009-09-20. ^ "Jones moves into 24 Oval Office". Reuters. 2007-07-21. Retrieved 2008-07-26. ^ "Cherry Jones, Ellen Burstyn, Cameron Mackintosh and More Inducted Into Broadway's Theater Hall of Fame". Retrieved April 10, 2013. ^ Dowling, Amber. "'The Handmaid's Tale' Enlists Cherry Jones for Pivotal Season 2 Role (Exclusive)". The Hollywood Reporter. Retrieved 25 January 2018. ^ a b Witchel, Alex. "Cherry Jones, at the Peak of Her Powers". New York Times. ^ Crews, Chip. "A Benefit of 'Doubt'". Washington Post. ^ "Cherry Jones: Prop 8 Supporters 'Will Be Ashamed of Themselves'". ^ "Velvetpark – Art Thought Culture". Retrieved 5 May 2015. ^ AOL. "Jones, Paulson Have 'Happiest Break Up'". Popeater. Retrieved 5 May 2015. ^ Bendix, Trish. "Cherry Jones on getting married and playing a lesbian feminist in Season 2 of "Transparent"". Afterellen. ^ Stephen L. Betts (7 November 2014). "Bradley Whitford, Cherry Jones Cast in Upcoming Hank Williams Movie". Rolling Stone. Retrieved 16 December 2014. Wikimedia Commons has media related to Cherry Jones. Cast Out: Queer Lives in Theater (U. Michigan Press, edited by Robin Bernstein) republishes the interview in which Cherry Jones first publicly discussed her sexuality. Shirley Booth was an American stage, film, radio and television actress. Amanda Michael Plummer is an American actress. She is known for her work on stage and for her roles in such films as Joe Versus the Volcano (1990), The Fisher King (1991), Pulp Fiction (1994), and The Hunger Games: Catching Fire (2013). Plummer won a Tony Award in 1982 for her performance in Agnes of God. Nancy Marchand was an American actress. She began her career in theatre in 1951. She was perhaps most famous for her television portrayals of Margaret Pynchon on Lou Grant and Livia Soprano on The Sopranos. Sarah Catharine Paulson is an American actress, director, and producer. She has received numerous accolades, including a Primetime Emmy Award and a Golden Globe Award. In 2017, Time named her one of the 100 most influential people in the world. Holland Virginia Taylor is an American actress and playwright. She won the 1999 Primetime Emmy Award for Outstanding Supporting Actress in a Drama Series for her role as Judge Roberta Kittleson on the ABC drama The Practice (1998–2003). She is also known for her role as Evelyn Harper on the CBS sitcom Two and a Half Men (2003–2015). Elisabeth Singleton Moss is an American actor. 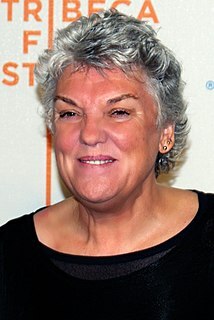 She is known for her work in several television dramas, earning such accolades as two Primetime Emmy Awards and two Golden Globe Awards, which led Vulture to name her the "Queen of Peak TV".